Backed by over 25 years of excellence, the HIPS and SIPS™ suite of products offers essential capabilities and professional grade tools for hydrographic data processing. Supporting over 40 industry standard data formats, HIPS and SIPS can easily integrate into any workflow. It enables you to simultaneously process multibeam, backscatter, side scan sonar, single beam and lidar data. It incorporates the latest in 3D visualization technology for the purpose of hydrography, oceanography and marine science. As part of the Ping-to-Chart™ workflow, HIPS and SIPS can be easily expanded to meet your wider geospatial needs. Following on the introduction of Drag and Drop processing in HIPS and SIPS 11.0, HIPS and SIPS 11.1 now offers the ability to completely customize the workflow applied when sonar files are dropped onto the application. With the ability to customize a separate workflow for each sonar format, you can easily automate your organization's specific workflow to be run through the HIPS Drag and Drop functionality. Through the Options dialogue you can configure HIPS file creation, Import, Georeference Bathymetry and surface generation. Understanding the increasing importance of quality backscatter products to our users, CARIS has been working to advance the backscatter processing capabilities of the SIPS Backscatter engine, while maintaining a fully autonomous approach. During most surveys, the focus is on collecting quality depth information using multi-sector sonars with roll pitch and yaw stabilization to ensure consistent coverage, and adjusting settings such as pulse length to ensure the best range and resolution are being achieved. However, these dynamic capabilities in real-time survey can be problematic when processing the backscatter intensity into consistent, usable products. The Beam Pattern Estimation process in HIPS and SIPS 11.1 for SIPS Backscatter has been enhanced to automatically handle dynamic steered sectors and changes in pulse length / waveform throughout a survey by creating a unique beam pattern for each mode and sector of a multi-sector system. This enhanced technique produces a consistent backscatter image, regardless of the dynamic settings during survey. Stay tuned as we continue to work throughout the year on introducing further improvements to the SIPS Backscatter Engine. EM3002 Backscatter Imagery. Source: Marine Institute. HIPS and SIPS 11.1 incorporates new licensing technology which will bring several benefits to our end users. Please note that the new license technology is not compatible with previous versions of the software, and your existing license configuration is still required for those versions. Please contact Teledyne CARIS customer support to receive your new license. For users traditionally sharing a USB dongle among multiple computers, we recommend that they switch to a network license environment and leverage the “commute” functionality to distribute licenses, including the new check out / check in option for offsite use. This avoids the risks or delays involved with shipping dongles to vessels or remote employees, while keeping control where the licenses are used. If users prefer to stay on the local license environment, the entitlement can be deactivated on one computer and transferred to another computer if needed. Users will need to contact Teledyne CARIS customer services to get assistance in this process. For users looking for the simplest way to open and process their data, HIPS and SIPS now supports Drag and Drop for raw sensor files. When you drag and drop files onto the application, the raw data is automatically processed, georeferenced, and a gridded surface is created. The new Georeference Bathymetry function is a single step which initiates Sound Velocity Correction (SVC), Load Tide, Apply Tide, Merge, and Compute Total Propagated Uncertainty (TPU). The same trusted algorithms are still applied but with the added benefit of being combined into a single process. This creates a more streamlined user experience requiring less interactions, and eliminates the need to concatenate Sound Velocity Profiles into a single file. Another new capability is the concept of having Dynamic or Static layers for tracklines. This allows the user to create a rule based layer using any of the trackline attributes. The dynamic trackline layer is a great way to manage your processing workflow, as data can be automatically grouped into layers based on what stage it is at in the process. 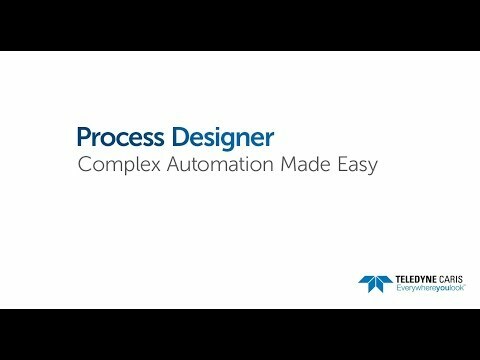 Process Designer has several usability updates to make it easier to design and validate a processing workflow. These include applying a modern design which makes it easier and more intuitive to interact with the application and creation of a Process Model. Which Package Fits Your Needs? Teledyne CARIS™ knows that accuracy and efficiency are all-important in your business, which is why the HIPS and SIPS solution integrates the processing of Sonar and lidar bathymetry, water column and seafloor imagery in a single application. Automatic Boresight Calibration Simplify survey planning and post-processing for calibration requirements. CARIS Onboard Improve survey efficiency, reduce turnaround time, and allow skilled workers to focus on the tough stuff.